Another weekend in Wisconsin under the damping effect of Governor Walker and his cronies calls for ... right! Another rally. We really need to fix this governor. He is morally broken. I have not seen any numbers for this rally yet, but I am estimating the crowd at about 3,500. 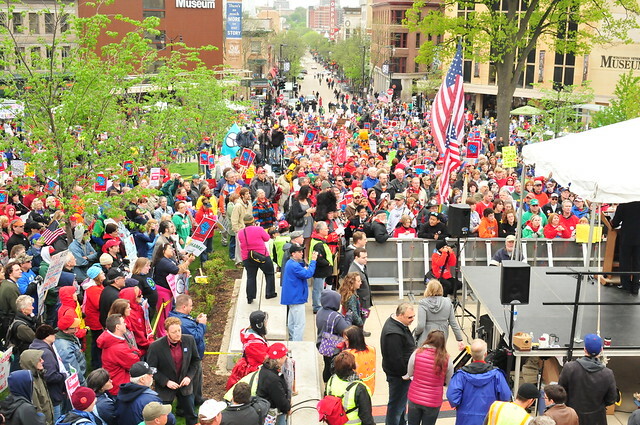 I am aware that buses came in from Milwaukee, Green Bay, Eau Claire, La Crosse, and a number of other Wisconsin cities (though I am certain that Fox "news" will say they were union thugs bused in from out of state, cleverly using Wisconsin school buses). 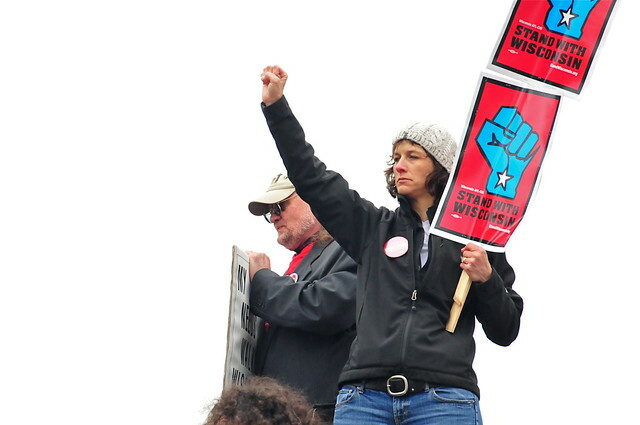 Despite substantial evidence to the contrary, the Current Occupant of the Governor's office still insists his draconian budget which slashes funding for public schools, Badgercare, and other social safety net agencies, drastically weakens unions, and eliminates the rights of public workers to negotiate for anything other than salary, is about creating jobs and "fixing the budget". Oh really? Is it any wonder that Wisconsinite are angry and continuing to take to the streets? Not that it matters to the Current Occupant. He is in his own little self-righteous bubble, convinced that he is the Savior of Wisconsin. Fortunately, the grass-roots effort to recall eight Republican Senators (and eventually the Current Occupant) is well under way and the Senate Republicans have started to realize what a hornet's nest of voter anger has been stirred up. 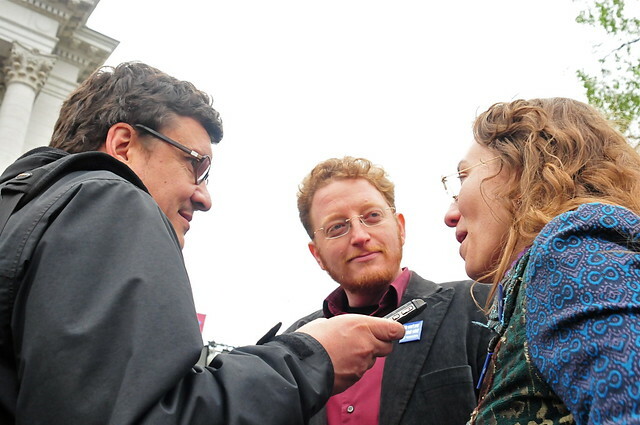 At yesterday's rally I had the privilege of brokering an interview between a visiting Swedish business journalist and local activists Ben and Sarah Manski. As long as the word keeps getting out, this fight is not over. There are a dozen or so additional photos here in a SLIDE SHOW. The photos go all the way back to Feb. 15th, but the newest images are up front.